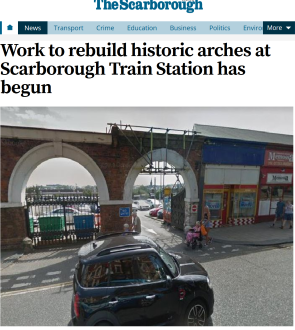 The Scarborough News has reported on how two of the historic railway arches at Scarborough train station are to be demolished and rebuilt after being damaged by a vehicle, offering a perspective for delegates to take to the 2019 Nottingham School. Network Rail has been granted listed building consent by Scarborough Council to make the repairs to the structure, which provides an entrance to the station’s car park. The wall, which faces onto Westborough, was damaged in 2017 but as Scarborough Station is a Grade II listed building any repairs have to be done sympathetically to the history of the structure. The plans were given approval under delegated powers by Scarborough Council’s planning officers.